Boston-based biopharmaceutical company Berg recently announced it joined an industry collaboration with Genomics England, set up by UK Prime Minister David Cameron to sequence 100,000 human genomes and ultimately creating a new genomic medicine service for the National Health Service (NHS) by 2017. Pharmafile.com spoke to Berg co-founder, president and chief technology officer, Niven Narain, to find out more and hear his predictions for the patient and big data-driven industry of the future. Pharmafile.com: Could you give us some background on Berg and its work, as well as your own background in the industry? Niven Narain: The three founders of Berg are myself, Karl Berg (one of the early co-visionaries of Silicon Valley), and Mitch Gray. Karl and Mitch founded the company in early 2005. Before Berg, I was head of continuous oncology at the school of medicine in Miama, so I came out of an academic oncology environment. What I really noticed was that there was a strong disjuncture between the research ongoing in the clinical practice: doctors scripted into lines of therapy with a one-size-fits-all approach. The outcome for some cancers is extremely poor, and it really challenged me, in the early part of my career to say how can we do this differently? How can we triage and understand patient biology to begin with, combining biology with technology, which is the artificial intelligence, to really make sense of patient data and truly make a positive impact on people’s lives. Pf.com: How did Berg’s partnership with Genomics England come about? NN: We firstly did a collaboration with the US Department of Defence, initially on prostate cancer, which has now extended out and the original introduction was done through one of our current partners, the head of Genomics England, Paul Jones. When we met, we found the philosophies of the Prime Minister’s initiative and our own had many similarities. 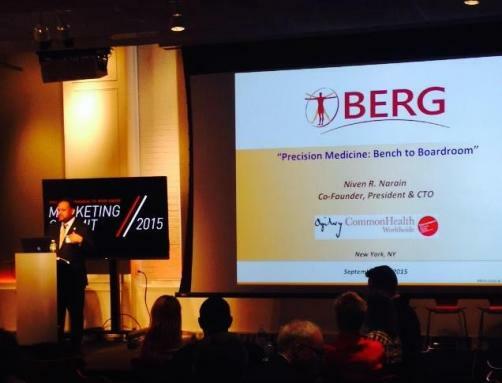 Pf.com: How does Berg employ artificial intelligence to analyse data and combat disease? NN: At least in cancer, diabetes and other major diseases, we have some understanding of how it works. In neurological diseases, especially Parkinson’s, I couldn’t sit here today and tell you what the various pathways that govern that disease are; it’s unknown. So what we’ve done is by using tissue and blood samples and the health records of patients with Parkinson’s, we’re able to apply this process of interrogative biology, to really find that ‘staircase’ of degeneration within Parkinson’s, but more importantly, define a map, define a signature of individuals. It’s their signature that can be tied or correlated to that biologically, so instead of this guessing game that doctors have to use right now, we want to arm doctors with tools to firstly help fight the disease, find biomarkers to diagnose the disease and of course then use that knowledge to be able to develop novel drugs that are biology-based, instead of just screening chemicals. Pf.com: How does Berg’s approach differ to that of other companies in the same field? Most of the big data approaches you see today are based on publically-available data, so they’re pulling data from publically-available sources, in addition to starting with hypotheses. So they’re saying ‘here’s the area of the genome or the biology that we want to focus in on” and seeing how it operates in a certain disease. So it’s hypothesis-driven, and it’s truncated to a given area. What we’re doing is flipping the entire model upside down and saying we’re not going to make any hypothesis; we’re going to allow the data to drive hypotheses instead of the hypotheses driving data. Feed all of the data into the system, and what comes out looks like an airline map, that says ‘we know BA has a big airline hub at Heathrow, at Kennedy, and a big Asian hub at Singapore, and from this data, we can tell where the key pressure points are. Our interrogative platform in the artificial intelligence allows us to find the key pressure points in the different kinds of disease, and that’s where we clue in on them. We allow the data to guide us. Pf.com: What has changed technologically in the decade since Berg was founded and what more has that allowed you to do? NN: The advent of omics platforms allow us to look at certain metabolites and Lipids, and even the field of proteomics has come a long way. Genomics has come a long way. Being able to look at whole exome sequences: 10 years ago, that wasn’t on anybody’s radar. We knew it was a possibility, but exomes have since become one of the key forefronts of genomic profiling, and health records, the ability to look at electronic medical records, in an annotated form. The spirit of collaboration is a lot different than it was in ’05. People are more willing to collaborate, share data and companies, governments and academics and institutions are letting those walls down so that we can share and everybody benefits from the outcome of the data. So I think the way of partnering is very different. Pf.com: And looking forward 10 years from now? NN: I think the patient is going to drive the process and be more aware of what is going on in their health, because there will be more longitudinal measurements, more real-time assessment. It’s giving the power back to that patient and I think this will result in us being able to predict financial models more effectively in healthcare and since NICE recently said they won’t cover AVASTIN, outcome-based assessment is going to drive a want and need for pharmaceutical companies to figure out who is going to respond to their therapies, or they’re not going to get reimbursed. I think that economic reality will help galvanise a collaborative spirit in pharma like we’ve never seen. When we sit here 10 years from now, we will know so much more about our real-time health, which is better for the NHS, for Medicare in the US, insurance companies, for all of us. Pf.com: Could you give us an update on Berg's BPM31510 candidate? NN: We have two forms of the drug: one topical which is cleared for phase II clinical trials. The other is an intravenous formulation, which is now going to complete Phase One and we are going to go into multiple Phase II trials in 2016 to look at very highly metabolic cancers like Pancreatic, GBM, Gastrointestinal cancers etc, so we are really excited this drug, by use of this platform we were guided in the areas of highly metabolic cancers and predict which indications or cancer types to focus on. What is really nice is that the clinical data from the late Phase 1 trials is correlating the functions that the platform predicted, so it’s really cool that you can use this process very early on to look at effects in drugs that you may not have seen until late Phase 2 or early Phase 3 trials. That’s if it works! So 2016 is going to be a very active year for us. Pf.com: What would represent a successful year for Berg in 2016? What do you hope to achieve? NN: Launching at least three or four major indications in cancer and starting to see the responses of survival, because it’s one thing to get patients in trials, but another to see the effect on consumers. We need to get to a point in Oncology where we’re treating the patient and not the disease, and that’s what I want to be able to realise for Berg, and that would make me very satisfied. Pf.com: How big an impact can big data have on the way healthcare is delivered? NN: If it’s used in the right way, in a manner where all the key stakeholders: governments, insurance companies, payers, doctors, patients, academics and medical centres are able to use it in a form that is common and gives each party an outcome that benefits their endpoint, then big data is going to not only revolutionise healthcare, but push the reset button on it, and I think that is now a reality. It is happening today. Berg, other companies, Genomics England, The Precision Medicines Initiative in the US, and big governments are all doing this, because now it is possible.